Discard any clams that are open or have broken shells. 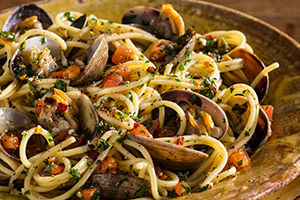 Place clams and wine in a 12- to 14-inch sauté pan set over medium-high heat; cover and cook for 5 to 7 minutes or until clams open. (Discard any clams that do not open). Reserve 6 to 8 clams in the shell for garnish; set aside. Remove shells from remaining clams over fine-mesh sieve lined with damp cheesecloth set over a bowl. Add clams to bowl with juice; set aside. In large pot of boiling salted water, cook vermicelli for 3 minutes or until al dente; drain well. Meanwhile, return sauté pan to stovetop; add olive oil and heat over medium heat. Stir in garlic and red pepper flakes; cook for 1 minute or until garlic is softened. Add tomatoes and reserved clam juice; cook over medium-low heat for 2 minutes. Stir in clams; season with salt and pepper to taste. Add vermicelli to sauté pan; reheat slowly, mixing well. Stir in parsley. Transfer vermicelli to serving platter and garnish with reserved clams in the shell. Serve hot.